Buy through MusicWeb for £12.00/15.00postage paid World-wide. Saydisc has an impressive catalogue of interesting and off-beat titles which, like the �BBC sound-effects� series and �Sounds of Steam� records, are the kinds of issues which used to pepper the eclectic and sometimes eccentric soundmass of the British aural experience in the age of the LP. These recordings were made in the 1970s, and are of course analogue to the core. The booklet notes describe the sound engineer�s heroic battle to find a location free of traffic noise, and the bulky equipment was eventually carried up the tower and set up in the chamber above the bells. With the sheer volume of sound from the bells I can�t imagine extraneous noise being such a problem, but I do know St. Mary�s well, and it does sit more or less on an island surrounded by busy roads. All I can say is it was well worth the effort. The booklet introduces the techniques and complications of change ringing concisely, gives dates for each of the bells, has a strange, haunting photo of the ringing team on the back cover and relishes in those words like �Hunting�, �Dodging� and �Tittums� which add such antique colour to this, for most people, almost secret world. I�ve lived in The Netherlands for almost twenty years now, and remember change-ringing coming up in discussions as a student at the Royal Conservatoire in The Hague where I now work. Arguments raged about minimal music, and I never really succeeded in convincing my colleagues that they could all dump Glass, Reich and Riley if only they could discover change-ringing. I�ve always experienced this uniquely British sound in much the same way a good performance of �In C� might have affected American audiences in the 1960s, and with the advantage of hearing such gorgeous sounds at all kinds of distance, maybe even mixing with a competing set in the next town, the sheer euphoria of those bells cannot, in my opinion, be beaten. Here in Holland, we have the Carillon tradition, by which the bells are played on a kind of keyboard made with wooden pegs. This has its own advantages, but all too often what one hears are dire arrangements of West-End musical hits or �appropriate� Church hymns. My mate Joost the jovial composer also happens to be town carillon player for Den Bosch so I know all the ins and outs of the carillon. He once asked me to write a piece for the two sets of bells in that noble town plus three carillons mounted on trucks dotted around the streets below. I did my best, but your change-ringers were always going to win � hands down, or up, or�. This kind of recording is always going to be a big sentimental hit for an ex-pat like me, but apparently even bell-ringers themselves say that �this recording represents the finest committed to disc.� Knowing how much training and disciplined practice it takes to make a 12-bell team sound even and as one, I can only listen in awe as they run faultlessly through all of those complex methods. As previously mentioned the recordings are excellent, with some tape hiss audible but only at the opening and finish of tracks. With only a very few almost negligible moments of tape damage my only real criticism is the rather swift and inelegant fade-out at the end of each track. It would have been nicer if the tracks were longer as well, but the timings are of course designed to fit onto the limitations of the LP. 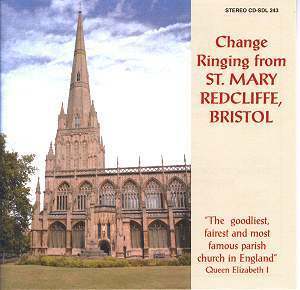 You might not realise it, but change-ringing is one of those very few things remaining which can properly and uniquely be described as �British�. If your Sunday mornings are rung-in by a local church, count yourself lucky. If you are a Brit abroad then your sap may well be revived by this disc in much the same way as the last night of the Proms. If you are a big fan of minimal music � especially the early stuff, then you owe it to yourself to discover this truly stunning aural phenomenon. Personally, I plan playing it at full volume when all the fireworks go off this Dutch New Year!